Valentine's Day at Forsyth is about more than just candy hearts! 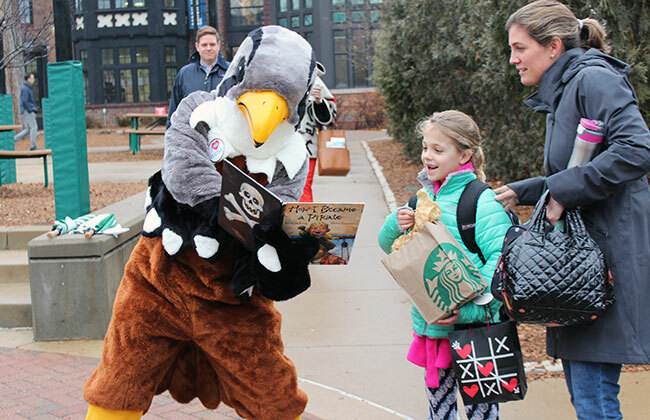 The first treat of the day was Freddy Falcon front and center to greet students arriving at school with high fives and hugs while holding a book and wearing an I Heart Reading sticker. Little Friends, Big Friends, Grand Friends, great friends . . . all focused on the love of reading. 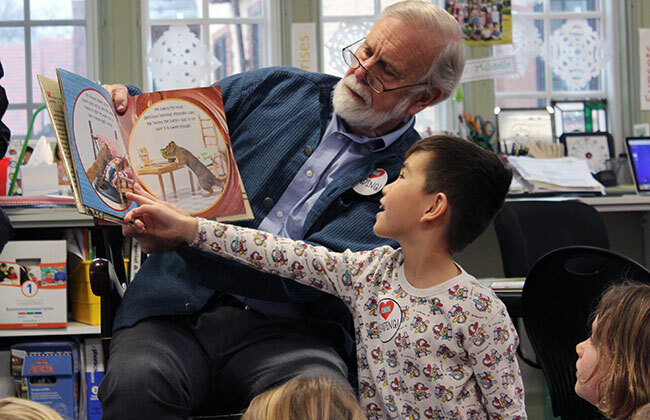 Area Grand Friends came with their favorite books to read to classes right after morning meeting, often with a proud grandchild near their side. 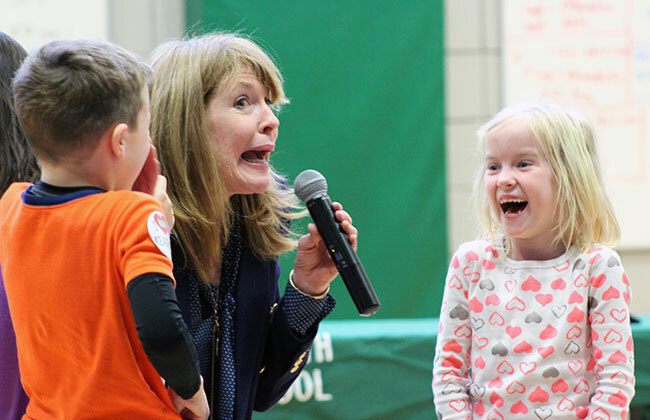 Throughout the day, the Rand Center filled in two shifts with Forsyth children seated on the floor for the keynote speaker, Missouri author Kate Klise. Funds raised through the Forsyth Family Organization (FFO) paid for her visiting fee. Librarian Melissa Pillot, arranged for her visit Ms. Klise was equally engaging and entertaining for both Lower and Upper School groups. She invited students to "help" her write a story as she explained story construction with words from our kids. There was a lot of laughter involved! Ms. Klise also stopped by Pre-K for a special story time and questions and answers. 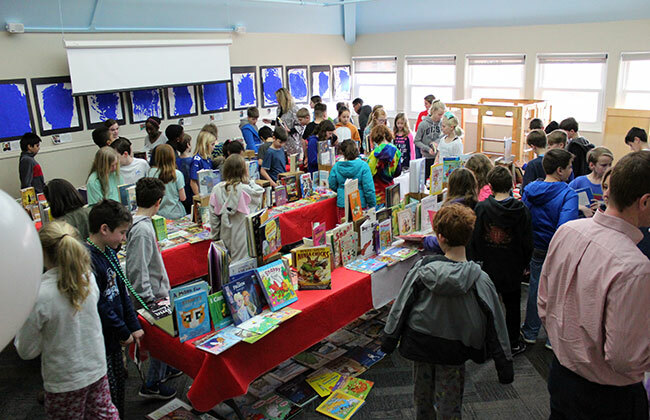 The Big Recycle Book Exchange filled the Fillmore multipurpose room with books for Forsyth readers of all ages–all from Forsyth readers of all ages. 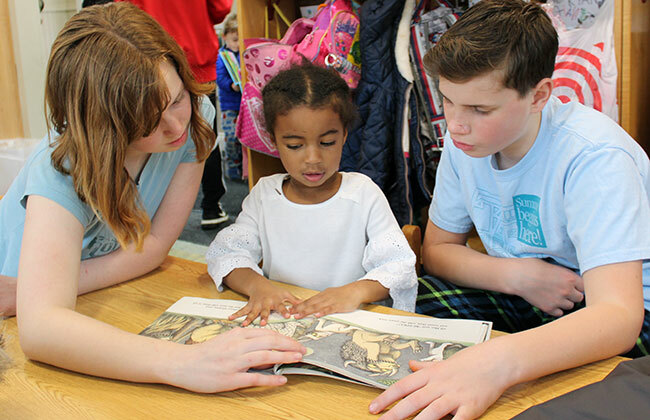 Every child at Forsyth School went home with a book on I Heart Reading Day. Children lined up to pick the perfect book. Many then sat down and delved right in. If you contributed gently used books to the book exchange, you can be sure that your donation was much appreciated by a Forsyth reader. Major thanks to the parent volunteers who collected, sorted, and arranged all those books by age/reading level and subject matter. No small feat! Big Friends crossed paths with Little Friends throughout the day. Reading, reading, reading was everywhere. 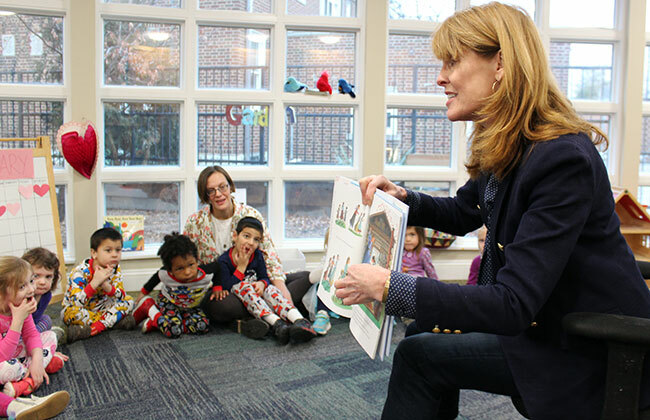 PJs were the uniform of the day for I Heart Reading Day– because nothing is better than pajamas and a good book!